Yacht Club Hagnau / Bodensee e.V. Pennant divided by a chevron, blue hoist, yellow fly. Bodensee is the German name for Lake Constance. It is a white pennant with a black cotized scandinavian cross. At the intersection-point of crossbars is a red roundel with a white "Hamburg-gate". Source: I spotted this flag on 4 April 2004 on Billerhuder Insel, Hamburg. The HMV was established in 1980 as a pressure group of motor yacht clubs in Hamburg and some locations around. The association tries to represent the clubs interests and makes negociations with politicians and economists. 30 clubs are members of the association. The HMV is member of DSV and DMYV. I spotted all flags on 30 June 2007 at the boat house of Elbe Motorboot Club Hamburg. It is a white flag with a horizontal red stripe at the top edge, containing white capital letters "HMV". Shifted to the bottom is a white Hamburg-gate in a red field bordered by a white steering-wheel with 6 spokes. It is a white triangular pennant with a horizontal red stripe at the top edge, containing white capital letters "HMV". Shifted to the bottom is a white Hamburg-gate in a red field bordered by a white steering-wheel with 6 spokes. It is a white triangular pennant with a horizontal red stripe at the hoist, containing white capital letters "HMV". Shifted to the fly is a white Hamburg-gate in a red field bordered by a white steering-wheel with 6 spokes. It is a blue pennant with two red figures, being probably part of an aeroplane's rudder. Source: I spotted this car sticker on 21 December 2008 in Hamburg-Lokstedt. White pennant with a red Scandinavian cross fimbriated black and white (1:2) and a black disc placed upon the cross. Red and white are the traditional colours of Hamburg. This burgee - and a few others - are clearly inspired in the Imperial war ensign. I assume that all those clubs were established at least before WW2. The problem is, that there exist different versions of that flag. On the car-sticker version the black roundel is just touching the black lines of cross-fimbriation. On the wall of clubs boathouse is an image, in which the roundel exceeds the crossbars. This one is the version of the flag, hoisted upon the boat house at the banks of Alster lake. The club also has a flag-version with same pattern as burgee. Source: I spotted this flag at the club's landing stage on 15 April 2012. White pennant with a red Maltese cross. Red and white are the traditional colours of Hamburg. The yacht club website shows a (rectangular) flag, rather than a pennant-shaped burgee. Pennant divided by a white Scandinavian cross, blue hoist and red fly. It is a red pennant with a white hanseatic cross shifted to the hoist. The pennant has a white bordure. It is a black pennant with a white Scandinavian cross, superimposed by a white roundel containing a red Hanseatic Cross (similar to a cross potent). 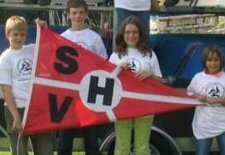 Source: I spotted this flag on 8 January 2007 at clubs boat-house in Hamburg-Wilhelmsburg. Blue pennant with a horizontally-placed yellow "Y". Blue and yellow are the Hagen colours - where the club is located -and the pall fesswise recalls somewhat the yellow oak tree on blue on the Hagen arms. Green pennant with a blue rectangle in the middle and a yellow castle overlapping on the upper hoist part of the rectangle. Hattingen is located on the river Ruhr, between Bochum and Wuppertal. Diagonally divided red-white-blue pennant, with three white right triangles outlined in black in the white stripe. The municipal flag of Heilbronn is horizontally divided red-white-blue. It is a light blue (FIAV-code B-) pennant, divided in the middle by a narrow horizontal white line. Upon the line shifted to the fly is a white parabolic arc, symbolizing the bridge crossing Fehmarnsund. Shifted to the hoist are two white sails. Heiligenhafen is part of Ostholstein county / Schleswig-Holstein and is located just opposite to the isle of Fehmarn. Source: I spotted this car-sticker on 10 January at Hamburg-Wartenau. Blue pennant with an orange part along the hoist, a blue sailing boat in the orange part and a orange canoeist in the blue part. Herbede is located on the river Ruhr, east of Hattingen. Formerly Vereinigung der Hochschulsegler e.V. - Blue pennant with a white border, with [a large white serif V touching both hoist and top and bottom sides], and three white triangles near the tip. Horizontally divided blue-yellow-red with a traditional sailing boat in the middle. Blue pennant with a white right triangle, the letters SG in white in the blue field and H in blue in the triangle and the year 1978 below the triangle. Hörstel is located near the intersection of Mittellandkanal and Dortmund-Ems-Kanal. Red pennant divided with an horizontal white stripe and a vertical white chevron. Letters S and V, in black, in first and fourth quarters, respectively. Over the arms of the "cross", letter H in black in a white disc. All elements of the burgee are fimbriated in black. The yacht club is located on or near the Dümmer Lake. This photograph shows the burgee with no fimbriations, different fonts and the disc nearer the hoist, with the slant stripes starting roughly at the disc's centre.